Is 19 eBook Formats 18 Too Many? Which ebook formats do we really need? 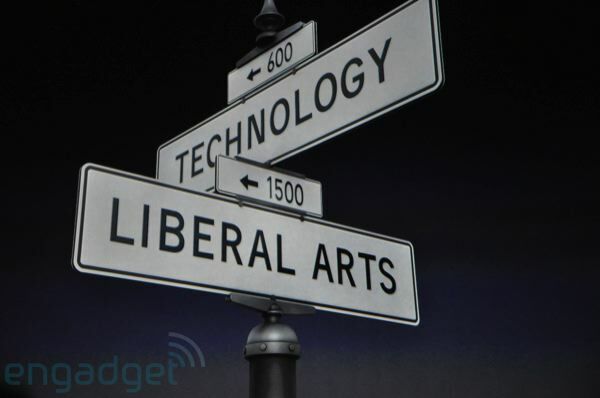 1. ePub – Not because it’s any good, but because it’s an industry standard, not just one vendor’s idea. 3. txt – I wish this would go away as an ebook standard, but the folks at Project Gutenberg are my heroes, and can be cut a lot of slack. RTF is preferable as a container for .txt.4. 4. HTML – Because simple native browser support for reading makes the most sense, long term (via XHTML and CSS3). And the rest be damned (except for a couple of legacy formats, like Newton and PalmDOC, which vendors can support if they’re feeling generous and have time on their hands). Each of these formats could be handled in the browser today except for the darned DRM. So that’s the theory. The real world has commercial realities that all publishers need to contend with. I stumbled upon an excellent site from South Africa this morning – Electronic Books Works and its thorough Knowledge Base. You can also download a good little ebook about ebook design and formatting. This blog entry was prompted by a contemporary cartoon strip about book burning. It’s by Randall Munroe of xkcd.com (via Kate Eltham’s Electric Alphabet blog). This led me down a long road of inquiry, first into the history of book burning, then over to Ray Bradbury’s wonderful 1953 novel Fahrenheit 451. Although most associate book burning historically with Nazi Germany, it does have a much longer history. But for many of us Bradbury’s book (and François Truffaut’s 1966 film adaptation) resonate most strongly when book burning is mentioned. The story of the novel is a book in itself, Match to Flame: The Fictional Paths to Fahrenheit-451. The publisher explains that “Ray Bradbury didn’t sit down one day and decide to write his classic novel Fahrenheit-451. 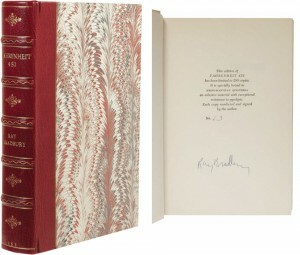 As with Something Wicked This Way Comes Bradbury’s tale of censorship had its roots years earlier—in at least 9 short stories or novellas,” all of which are included in this $100 limited edition (two of them previously unpublished). It is only now, some fifty years after that L.A. police officer challenged my right to be a pedestrian, that I see the odd ideas that rose to perform in short stories, which went unnoticed as I wrote them. I wrote another tale, “Usher II” in which my hero complains that he, as a fantasy writer, is rejected by the intellectuals on earth who make fun of the grotesques that sprang up in the tales of Edgar Allan Poe and other similar authors. And years before that, I published another novella, called Pillar of Fire, in which a dead man rises from the grave to reenact the strange lives of Dracula and Frankenstein’s monster. All of these stories were forgotten when I first wrote Fahrenheit 451. But they were still there, somewhere, percolating in my subconscious. Another story, related though tangential, is of the visual inspiration the book has offered to the cover designers of its many editions. There are hundreds. One designer, Mikey Burton, revisualized a fascinating series of cover designs as a school project, all viewable here. There is also a comic book version, authorized and introduced by Bradbury. The Wikipedia entry on the novel states that the cover second from the left is the original design although Bookscans reports that the third cover was the original, and also the 41st title originated by Ballantine Books, founded the year before. The paperback cost 35 cents. There was also a $2.50 hardcover edition, which searching further afield, I see can be purchased, signed by Mr. Bradbury, for just over $4,000. It was indeed published with cover #2. The irony of this particular book being bound in asbestos is delicious: a book concerned with burning books (and the free exchange of knowledge and information they represent) that is itself resistant to destruction by fire. Bradbury must feel a great sense of pride in such an irony. For a long time, Fahrenheit 451 was the only genre book ever to be bound in asbestos, and it’s still one of two to hold that disctinction. In 1980, Stephen King ordered a limited number of copies of his novel Firestarter bound in asbestos as a tribute to this particular release of Fahrenheit 451. The number “451” refers to the temperature at which book paper combusts. 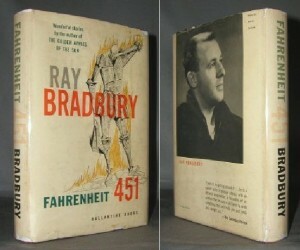 Although sources contemporary with the novel’s writing gave the temperature as 450°C (842°F), Bradbury is believed to have thought “Fahrenheit” made for a better title; however, in an introduction to the 40th anniversary edition of the novel, Bradbury states that a person he spoke with at the local fire department said “Book-paper catches fire at 451 degrees Fahrenheit”. A literary license was taken by Ray Bradbury when he named “Fahrenheit 451” (novel, 1953) after the temperature at which paper ignites (the range is about 218°-246°C or 424-474°F). The conversion for 451°F is 232.8 °C . 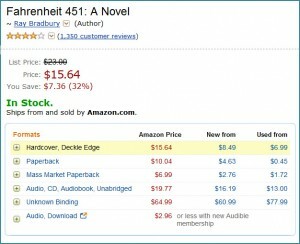 Amusingly, the actual book, Fahrenheit 451, is not available in eBook form! Nor are any of his other books available for digital erasure. I’m not going to research why not, whether it’s a Random House decision, or a Ray Bradbury bias. eBooks would have frustrated the Nazis. And an updated Fahrenheit 451 might be titled Amazon.com Server Crash Vandals. The Apple iPad: Push or Pull? When we evaluate new technology I believe that the key equation is “push or pull.” It is the rare new technology product released to the public where the reaction is an immediate: “I want that.” I suppose Facebook and Twitter are recent examples of “I want that” being a very common refrain. It certainly didn’t hurt that they were free. Microsoft pushed Vista for years without much success. Windows 7 is being pulled by consumers and businesses in record numbers. Many new products need to be pushed hard onto the public, with the vendor hoping that it will catch on, “cross the chasm,” and thereafter an eager public will pull the product close, egged on by great reviews and great word-of-mouth. In the case of Apple’s new iPad, was the public looking for something that met an unfulfilled technological requirement, or just hoping that Apple would provide a newfangled “must have” device? I imagine that most (myself included) were looking for the latter. Did Apple fulfill that promise? I think not. With the exception of a large and beautiful (albeit LCD) screen, we are apparently being offered a very large iPhone, without built-in telephonic features. We can now access iBooks, a late and thus far weak entry to the eBooks foray (albeit in color). The pricing is better than expected, although if you sign up for the whole package, the price does exceed $1,000 in year one (and most consumers will be drawn to get all the storage available as well as 3G). As a general observation Pogue makes a good point. Based on the rumors of what the Apple tablet would offer I planned to buy one. Having looked fairly closely at the iPad, I’ve put my credit card back in my wallet. It is the bane of the current eBook mania that I must, as your humble servant, continue to give this subject far more coverage than I would like to. At the Las Vegas (“City of Disappointment and Personal Bankruptcy”) CES (Consumer Electronics Show) which ended today, there were a slew of new eBook reader introductions. This lead the U.K.’s Financial Times to run a headline, “E-readers Face Risk of Saturation.” My first thought was that surely this means that those who read about eBooks would soon rebel and refuse to read any more articles on the subject. But no, it was a reference to the devices themselves, which prior to the show, I understood to stand at 40 different chunks of mostly E-Ink encasements. If all of the introductions planned in Las Vegas come true, there will be roughly 60, many of them featuring new display technologies. They will be more specialized, as several will focus closely on periodicals rather than books, and other on flower display techniques (OK, kidding). Regardless, the story will obviously be playing out for quite some time in 2010. 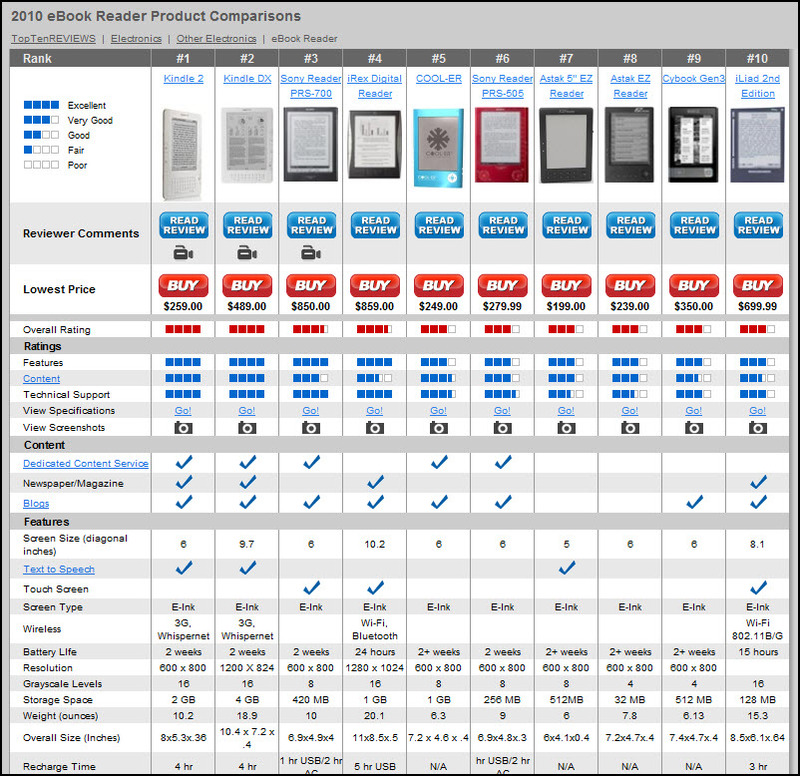 I wanted in the meantime, as a reader service, to offer you one web site’s notion of the top 10 eBook devices. I know that I need not remind you that any review site that includes a “Buy” button near the top of its review should be considered as potentially biased. But for what it’s worth, if you must buy an eReader, this site may perhaps offer guidance. Another update: a wealth of information here.